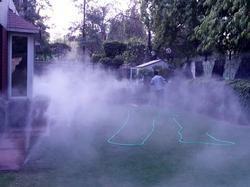 We are leading manufacturers and suppliers of a comprehensive assortment of Misting system. Our entire range is manufactured at our highly advanced manufacturing unit, under the supervision of our experienced professionals. We, at the frontier of developing efficient tools, have brought Misting System based on non-toxic and bio- degradable solutions. Being easy to operate, these are good at reducing the ambient temperature and offer various advantages of enhanced air conditioning. These are affordable solutions and highly demanded at our consumer's end. Cloud Tech offers Mist Cooling System that is known for optimum performance in reducing temperature and can be used as an exceptional alternative to air conditioning systems. These are installed and operated conveniently and are apt for outdoor and indoor purposes. We ensure our clients flawless products, which are efficient and user-friendly, at competitive prices. Mist System, designed and manufactured by us, is of great importance and is used for cooling purposes. We offer these products in custom formats as per the specifications asked for. These are our valued offerings and can be purchased at competitive prices. Our innovative engineers have designed this product using latest technology and in compliance with the set industrial norms.